Despite what anyone says, when it comes to human behavior, there is no such thing as normal. One can talk about an average way of acting, but normal is much more of a judgment call. What may seem like unusual activities to you, may be status quo to someone else. This is especially true when it comes to extreme circumstances. Some people cry when they are happy, others laugh uncontrollably when they are sad? Is either "normal"? Who's to say? The film Demolition examines grief and shows that the death of a loved one can certainly have atypical affects on a person. Demolition introduces us to Davis Mitchell (Jake Gyllenhaal), a successful businessman who is married to Julia (Heather Lind). As the film opens, the couple are involved in a car accident and Julia is killed. While waiting in hospital, Davis attempts to purchase Peanut M&Ms from a vending machine, but the candy gets stuck. Intending to complain, he takes down the company's information. Following Julia's funeral, Davis writes a letter to the company asking for a refund. Before he knows it, his is describing his entire ordeal in the letter, which really makes him examine his life and his relationship with Julia. Soon, Davis is writing letter after letter to the company, abandoning the issue with the vending machine, and simply pouring out his heart. Thus, he's quite surprised when Karen (Naomi Watts), the company's customer service rep, contacts him and the two begin to share in one another's lives. Demolition is not based on a novel. I tell you this to save you the work of looking it up on your own. And yet, Bryan Sipe's (who I don't think is the same person as the former Cleveland Browns quarterback) script truly has the feel of a novel. From the original core idea to the quirky characters, this feels like something which came out of a book. Along the way, there are small details, which really help to flesh out the story, which also give the impression of a literary work. And this is Demolition's true strong-suit. The truly unique concept introduced at the beginning really draws the viewer in. Julia dies in the very first scene and it's not long after this that we see Davis pouring his heart out in a letter to a vending machine company. This seemingly simple act of catharsis then grows into a sort of obsession with Davis, as these letters are the only escape which he has from his perfect, button-down life and the pressure from his father-in-law/employer, Phil (Chris Cooper). Due to his grief, Davis begins to take his life apart, both literally and figuratively. Julia's death forces him to examine the life which they had together and he begins to realize that it wasn't exactly as it seemed. At this same time, Davis begins taking apart items around his house and office to see what is inside of them. The examination of a marriage becomes a metaphorical investigation of the world, as Davis suddenly wants to see inside everything, with his quest becoming more and more destructive as he goes along. By the end of the film, we have taking a journey through Davis' grief with him. Sipe's story pretty much dismisses the Kubler-Ross theory of grief and simply explores how a devastating event can nearly destroy a person. Given the high-points of Demolition's script, the flaws really show through and it's these mis-steps which keep the film from truly achieving greatness. First of all, Davis' socio-economic status may keep some viewers from completely buying into the film. Yes, the loss of his wife is sad, but watching this rich, privileged white man who has a great support system have a breakdown may not elicit the kind of sympathy which the movie wants. Is it trying to tell us that even the elite can't escape tragedy? Perhaps, but while Davis may seem inclined to destroy his nice things, we certainly don't see him opening himself up to a life of poverty. The middle of the film becomes far too side-tracked with Davis' relationship with Karen and her son, Chris (Judah Lewis). Yes, the film wants to show us how Davis is able to connect with people outside of his world, but this part becomes unnecessarily complicated and Watts character is yet another poor, uneducated woman who makes bad decisions. Why are there so few strong, smart women in movies? Despite these problems, Demolition is still a very interesting movie. It sort of plays like a Charlie Kaufman movie, but with the weirdness dialed way down. Again, the main idea is genius and rarely have we seen a character take seemingly ordinary things in such an odd direction. Gyllenhaal is good in the lead role, and he plays the manic moments well, but he's still a bit too baby-faced to be taken completely seriously. As one would expect, Cooper is the real stand-out here, as he's incredibly fierce and intimidating. We see movies all the time with widows and widowers, but few take the chances that Demolition does. Again, the middle gets a bit off-track, but the film is worth watching for the beginning and the end, and you'll never think of a grief process as being "normal" again. 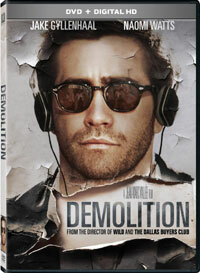 Demolition drastically lowers its resale value on DVD courtesy of 20th Century Fox Home Entertainment. The film has been letterboxed at 2.35:1 and the transfer is enhanced for 16 x 9 TVs. The image is sharp and clear, showing no overt grain and no defects from the source materials. The colors look good and the image is never overly dark or bright. The picture has OK depth, but it does get somewhat soft in some spots. The DVD carries a Dolby Digital 5.1 audio track which provides clear dialogue and sound effects. The demolition scenes provide some nice subwoofer and surround effects, as does the opening car crash. The in-film music fills the speakers and delivers a notable range of sound through the front channels. The only extra features on the Demolition DVD are a still gallery and the THEATRICAL TRAILER for the film.